January 29, 2006 by admin 0 comments on "DC Tiles"
DC Tiles was written by tekzel, a friend of DonationCoder.com, in response to a programming school challenge on the DonationCoder.com forum. 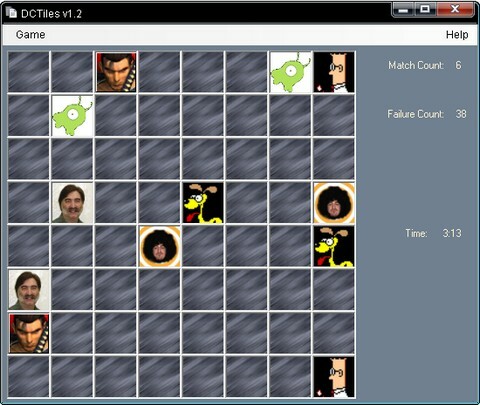 DC Tiles is a customizable tile matching (memory) game where you turn over tiles to try to find matching pairs. However, what's special about DC Tiles is that you can easily use your own images (and sounds even) and create fun games to send to your friends and family, or make a game using pictures of your kids or pets. The game supports multiple difficulty levels and scores you on your performance - great fun to compete with your kids. Requires the .NET v2 framework from Microsoft. Free for non-commercial use. A customizable tile matching (memory) game that lets you make your own games. pictures of your kids or pets. Even make your own sounds! performance - great fun to compete with your kids! The best thing to do with DC Tiles is to make your own custom matching games. the "tiles" folder and replace with your own. important (they will be resized). Then just zip the whole thing and send it to your friends. a benefit only available to paying members.